The makers of Promised Land want you to hate fracking, and they aren’t going to let little things like a script, acting or the filmmaking acumen of Gus Van Sant (taking the day off) get in the way. Steve (Matt Damon) and Sue (Frances McDormand) are a couple of natural gas sales people sent by their big, bad corporate minders to buy up the mineral rights in a small backwoods town named McKinley (filming took place in rural Pennsylvania), populated by sort of prideful but vulnerable hicks Hollywood imagines are ripe for such plucking. Space does not afford a discussion about the pros and cons of hydraulic fracturing (I rather side with the filmmakers). But it’s hard to achieve high-minded aims using this single-minded, half-baked screenplay penned by Damon (who once co-wrote something called Good Will Hunting) and John Krasinski (not a typo). 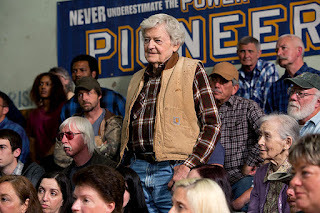 We’re told Steve and Sue are savvy, flannel-clad operators, but they’re apparently unprepared for the entirely predictable obstuctions of a meddlesome environmentalist (Krasinski) and a cantankerous fogey (Hal Holbrook). And despite the fact they a seemingly vast majority of property owners sign away the family farm or the land below the singlewide, it all somehow comes down to the Big Vote™ by townsfolk in a high school gym who will decide, well, I dunno. Whether fracking is bad? Whether property owners have the right to control their own land? Why Steve particularly cares what the resident hot schoolteacher (Rosemary DeWitt) thinks about him? Why Matt Damon has started making dreary, uninteresting movies?